The vision of New Journey Housing is to reduce the challenges newcomers to Canada face as they seek to attain and retain decent affordable housing in Manitoba with a priority in Winnipeg. We believe that newcomers should have the same access to housing as any other established resident. With a good home, newcomers are able to set a stronger foundation for themselves. New Journey Housing provides resources to train, assist, and support newcomers to Canada, and those who support them, through the process of attaining and retaining decent affordable housing in Manitoba. Partner with other housing initiatives and supportive agencies in assisting newcomers to settle well in Manitoba and work towards their housing goals. 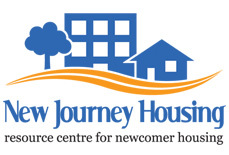 New Journey Housing is a resource centre for newcomer housing in Manitoba, with a focus on Winnipeg. We provide help, assistance, and resources to guide newcomers to rent or purchase housing. We also provide training on money management. Our primary clients are newcomers to Canada including permanent residents, international students, temporary foreign workers, and naturalized Canadians. We also support sponsors, landlords, and anyone else involved in newcomer housing. New Journey Housing is actively involved in advocating for and supporting new housing projects in Manitoba.